Key difference: Kickboxing and Karate are influences of each other. The main difference between the two sports is, Kickboxing is a combat sport, whereas Karate is a martial art form. Kickboxing and karate are different physical disciplines. They are considered influences of each other. Though there are several similarities between kickboxing and karate, they do have many differences between them. Karate is a martial art; it was originated in the 19th centaury in Okinawa, Japan. By the 20th century, it was one of the most widely practiced martial arts in the world. It is a striking art form that uses punches, kicks, knee strikes, elbow strikes and open hand techniques. In some forms or styles, grappling, throws, joint locks, restraints, and vital point strikes are also used. 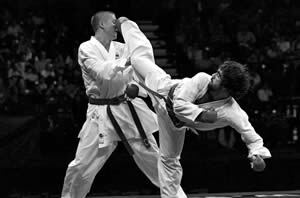 In karate, people use a series of ‘kata’ or ‘postures’ which can be offensive and defensive, and they learn to focus their power in punches and kicks which are designed to be very high impact. In karate, the open hand is used for various punches. A karate practitioner is called a ‘karateka’. However, learning karate is hard; it is taught from a perspective of self defense, with students learning specifically how to utilize karate techniques defensively. Karate can be practiced as an art, as sport, as a combat sport, or as self defense training. However, the origins of karate lie in spiritual practice, and some practitioners are involved in karate for this reason. Mental discipline and physical discipline go hand in hand in karate, and the practitioners are interested in focusing and developing their minds as well as their bodies. Kickboxing is a group of martial arts and stand-up combat sports based on kicking and punching; it is historically developed from karate. It is generally practiced for self-defense, general fitness, or as a contact sport. Kickboxing is considered as a hybrid sport; it integrates movements and traditions from many different sports, such as karate and boxing. It involves kicking, punching, elbow and knee strikes, throws, locks, and grappling techniques during a fight. It also involves standard kicking and punching techniques. It has three main defensive styles, with variation in each style based on the fighter. It is also very popular for weight loss and to develop general fitness. At times, kickboxing is also taught as a form of self defense, though it does not have a spiritual or mental component. Due to the popularity of the sport, kickboxing is a combat sport event in The Olympics. Here, during a fight standard and proper rules are followed. The fighters or boxers are required to wear gloves, and mouth guard for their own protection, at the time of the fight. A referee is present to monitor the fight. There are different rule sets and scoring system, where a winner is declared after the few rounds of fight. It is a group of martial arts and stand-up combat sports based on kicking and punching. It is a martial art based on punches, kicks, knee strikes, elbow strikes and open hand techniques. It is a sports event not martial art. It is more martial art than sports event. Only physical discipline is important. Mental and physical discipline, both are important. Gloves are worn during boxing. Open hand is used for various punches. It is a simple fighting and combat sport. It is a pure self defense martial art form. They wear loose tops and shorts. A proper white uniform is worn with a belt on the waist.